Mentor ry is a registered student society founded in 1974. 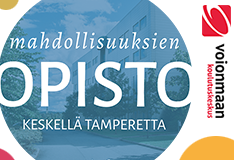 Our members are studying in the degree program of Life Long Learning and Education at the Tampere University, Finland. Mentor ry aims to fulfill the interests and rights of the members. We also keep in contact with the trade union Specia and with other student societies both in Tampere and other cities around Finland. We offer our members lots of activities including sport and culture events, different kind of parties and small excursions to see what the educational field has to offer our students in the working life. We warmly welcome all international degree students and exchange students of Faculty of Education and Culture (EDU) to join us in our events! We also organize tutoring for the international students, so you won`t be left alone under any circumstances. Mentor ry is run by committee members, who are elected every fall for the next year. The contact details of the committee members for year 2019 can be found here. If you have any questions or suggestions of activities, please contact us! You can contact either Iina Mäkelä, the person in charge of international affairs (iina.makela[a]tuni.fi) or the whole committee (hallitus.mentor[at]uta.fi). You are also warmly welcome to join our international FB-group “International Students of EDU 2019”!